This district, which is 42 kilometers north-west of Udon Thani, has an unusual mix of pre-historic cave paintings, fantastic geological formations and Buddhist shrines, the bulk of which are at Phra Phutthabaat Bua Bok, 12 kilometers outside of Ban Phue on Phra Bat hill. The area has been declared Phu Phra Bat Historical Park where nature-loving trekkers may take a hike around the beautiful parks, hills and forests. Phra Phutthabat (Holy Footprint) Bua Ban is located on the Phu Phan hill, approximately 12 kilometres south of Phu Phra Bat Historical Park. Also discovered and unearthed here at the sight are battlements carved in Dvaravati and Lop Buri arts. This is where the Buddha's Holy Footprint was found along side with various Buddha images of Lanchang style that can be dated back to 1044 Buddhist Century or 900-1000 AD. Later in 1920, the Chedi that resembles Phra That Phanom was built on top of the footprint. Situated in Ban Phue District, this archaeological site features a large number of ancient buildings and ancient objects of both prehistoric and historic times. They are mostly of Dvaravati, Lop Buri, and Lanchang style. The site is located in a thriving forest called Pa Khua Nam. In addition, within the site are many rocks of peculiar shapes which resulted from glacial movement millions of years ago. It can be seen that most of the ancient buildings and objects found in this area were modified from what was naturally available and not built entirely by human beings. For instance, a rock was decorated to make a stupa or was chiselled into the shape of a foot. The site was declared a historical park by the Fine Arts Department in 1991. Archaeological evidence found at the site includes Phra Phuttabat Bua Bok, Phra Phuttabat Lang Tao, Phra Phutta Bat Bua Ban, religious buildings modified from rocks, sandstone bai-sema (leaf-shaped stones marking the limits of a Buddhist temple), sandstone images and idols, cave paintings and stone axes. Phu Phra Bat Historical Park covers the entire area of the Phra Phutthabat Bua Bok which is around 1,200 acres. In addition to the beautiful landscape, caves and caverns, rocks of different sizes and shapes dot the area. Moreover, pre-historic paintings over cliff faces have been discovered, although many leave only the faintest of traces. Nature-loving trekkers may take a hike around the area; there are some beautiful walks through forests and parkland ranging from a short 30 minute route to a 5 hour route for the more serious walkers. The Park is located North East of Udon Thani and about 54km's from the main udon-nong khai highway route 2. Turn left at the 13-km. marker on to Highway No. 2021, which leads to Ban Phu and proceed for approximately 42 kilometres and then along Highway No. 2348 from Ban Phu 12 kilometres and then follow the signs leading to the park. 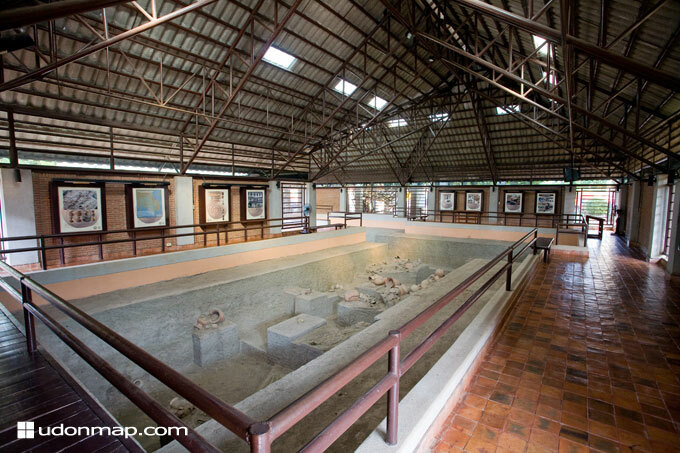 Visitors are also recommended to explore Tham Non Sao Ae, Tham Woa Daeng, Tham Chang, and Tham Sung to see the paintings that depict the livelihood of pre-historical community which can be traced back to approximately 2,500-3,000 years ago. The sandstone bai-sema, sandstone images and idols of Dvaravati era are also discovered at Poeng Hin Po Ta Luk Koei. Sunshine Orchid Farm (Map F1), one of Thailands first farms to produce orchids suitable to make perfume. A particular specimen that dances to music can be seen here. Perfumes are also available. Baan Na Kha ( Province Map G4 ) is a weaving village renowned for woven Khit (geometric, diamond-grid minimal weft brocade used in decorative fabrics). Locally made handicrafts can be purchased here for reasonable prices. Phu Foilom Park (Province Map F9) is a beautiful park located on a plateu surrounding Udon Thani, the area is suitable for hiking and camping, when walking amongst the park you may notice wild antelopes, rabbits and birds. There is a nice view over Udon Thani province too. The lower area of the park can get busy on the weekends with locals using the area for bbq's and eating. Huai Luang Reservoir ( Province Map E7 ), is a large reservoir under the Royal Irrigation Department's responsibility. It covers an area of some 20,000 rai with the capacity of 113 million cubic meters for water. It feeds 86,000 rais of agricultural area and also serves as a source of water for animals, crops and public water supply. Huai Luang is a scenic attraction ideal for rafting, fishing and cruising. A summer palace was constructed for the King's Mother who came to stay here almost every year when she was alive. and later renamed Prajak Sillapakhom in memory of Prince Prajak Sillapa-khom. Nong Prajak was in 1987 given a face-lift to celebrate His Majesty the King Bhumibol's 60th birthday anniversary. The lake is a pleasant place to escape from the busy city area and is popular with locals for exercise and aerobics. At night time this place comes alive with an array of food stalls which is proving to be popular place for locals. Than Ngam Waterfall ( Province Map F9 )This waterfall is located in the vicinity of Thab Kung district, Nong Saeng. Tham Ngam is a medium sized waterfall where you can swim in the cool water and make your way by foot to reach the fall. Prince Prajak Sillapa khom Statue ( Map M14 ), is a monument in the heart of the city which was erected in commemoration of Prince Prajak Sillapakhon, the founder of Udon Thani. Major General Prince Prajak Sillpakhom was the son of King Rama IV and Mother Sangwan in 1856. As a royal commissioner during the reign of King Rama V, he was entitled Governor of the Northern Province where he reigned from 1894. Kham Cha-Not. A beautiful deciduous forest and temple situated near Ban Wang 10km from Ban Dung and around 75km from Udon Thani. 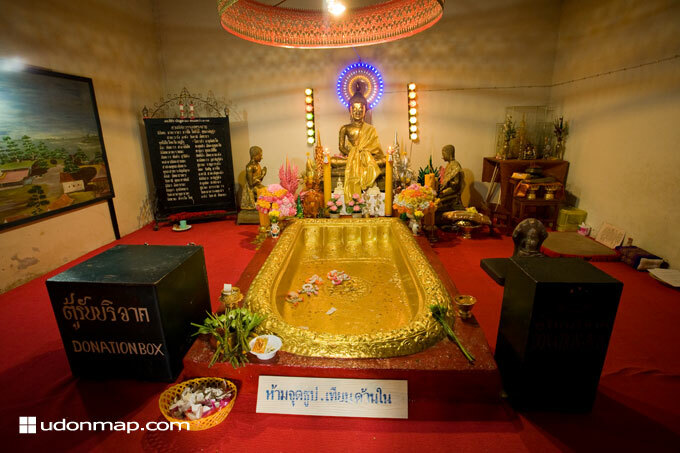 Phu Ya temple, Is a temple that helps the poor and people in trouble. It is located behind Udon Thani Train station near the Lake Nok Bua. Nam Som-Na Yoong, Is a forested park on the way to Amphoe Ban Phu 103km's from Udon Thani. There is a waterfall on the ridge of Phu Phan at a height of around 40m..
Chatede Loei, A winery and grape farm located 10km's from Amphoe Phu-Rua on the left. The grape farm covers and area of 1,000 rai. There are many products of wine, wine tasting and grapes for sale. Phra That Sri Song Rak monument was constructed in 1560 to commemorate the mutual cooperation between Krung Sir Ayuthaya and Krung Sri Satana Kanahut. You can get there when traveling from Loei along highway 203, turn right at km. 66, follow highway 2013 for 15km to Amphoe Dan Sai then turn right and continue 1km. Erawan Cave, A large cave with 107 steps that lead down to an impressive cave that houses a large statue. There is nice scenery around the cave area. You can get here by taking route 210 from Udon Thani to Nong Bua Lam Phu and then turn right and follow for 2km's.